Cruises from Bali Indonesia to Australia are few in number but are offered. They are one-way cruises from Benoa to Sydney. See the schedule of departures below. Bali is a famous island that is part of Indonesia. Volcanic mountains, rice terraces and sandy beaches highlight the beautiful landscape. Bali is about 800 miles northwest of Australia. 17-day cruise to Australia on Viking Cruises. One-way from Bali (Indonesia) to Sydney (Australia). Visit Lombok (Indonesia), Komodo (Indonesia), Darwin (Australia), Thursday Island (Australia), Cairns (Australia), Townsville (Australia), Whitsunday Island (Australia), Brisbane (Australia) and Newcastle (Australia). • 2018 departure: November 30. 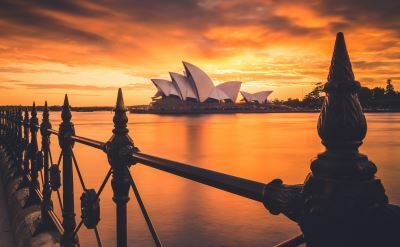 18-day cruise to Australia on Seabourn. One-way from Benoa (Bali Indonesia) to Sydney (Australia). Visit Senggigi (Indonesia), Komodo Island (Indonesia), Darwin (Australia), Cairns (Australia), Townsville (Australia), Hamilton Island (Australia) and Fraser Island (Australia). • 2018 departure: December 3. 16-day cruise to Australia on Silversea. One-way from Benoa (Bali Indonesia) to Sydney (Australia). Visit Komodo (Indonesia), Darwin (Australia), Cairns (Australia), Townsville (Australia), Whitsunday Islands (Australia) and Brisbane (Australia).